Remove the tendency to overpower the front tires under hard cornering and minimize traction robbing body lean with the CorkSport Mazda 6 Rear Adjustable Sway Bar. Compressing inside suspension, the Mazda 6 Rear Sway Bar effectively increases the spring rate on side of the suspension which is compressed most and its adjustability allows you to fine tune the handling. Each Mazda6 swaybar includes machined 6061-T6 aluminum swaybar brackets which are more durable than the stamped steel design common with other swaybars and look sharp with an anodized black finish. 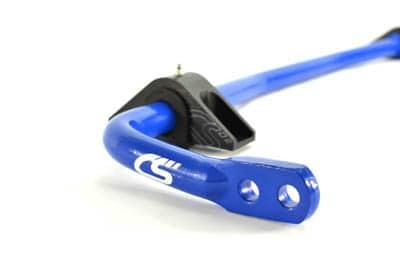 Adjustable: Two endlink attachment points to change the swaybar from 130% to 220% stiffer than stock. Single Piece: A single piece is used to create the rear swaybar which adds strength by removing weak points such as welds. Billet Swaybar Brackets: Superior bracket design with grease fittings for easy servicing with 90a durometer polyurethane, our brackets and bushings are the last you will need. Once installed, the reduced bar movement gives you extra confidence when taking corners. 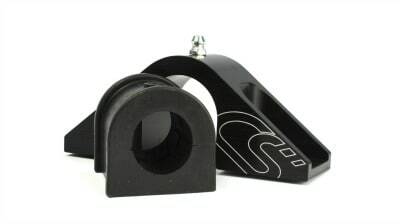 Extra Value: Includes Billet Swaybar brackets, at $79.99 value. One piece design: CNC bent for precise fit and made from 25mm 4130 Steel. Adjustable: Two adjustable locations for the end links to install allowing you to change how much the bar uses the other side of the suspension. 130%/220% stiffer than stock on the Mazda 6. Made in the USA: Engineered and manufactured by CorkSport in Vancouver, Washington. Durable blue powder coated finish: can survive the winter driving in areas where roads are salted for snow and ice. CorkSport Service and Support: Receive a two year limited warranty, full color installation instructions, all of the needed installation hardware, and knowledgeable telephone support. I’ve been driving with this set at 130% for 1 week and my 2016 Atenza now handles like a sports saloon . The combination of this rear sway bar and the front strut brace has made a significant improvement to the handling of this car. For anyone considering handling improvements, just buy these 2 together. Well done Corksport on another high quality excellent performance part. I have had this sway bar installed on my 2015 6 for a few days now and I am mighty impressed with how much it has improved the handling. I took a ride through the twisting mountain pass and had zero understeer taking the curves at 70 mph and up. The car was so well planted and help the road like a dream. I have had this installed on my 2016 Mazda 3 sedan for about 2 months and took it for one autocross event. First time that I installed it, it was awesome! No issues whatsoever. But recently it made a rather harsh "thudding" noise/sound when going up a driveway, pothole or when making a sharp right turn. When I jacked up the car, I did notice that the collars moved OR the sway bar itself was moving around. (Not sure which one). I tighten everything down and moved the collar flushed to the sway bar bushings and brackets as it supposed to be. But the thudding noise was still there. The installation of the sways was a bit difficult for the 2014+ Mazda 3 sedan because of its location. There were a lot of parts that had to be removed (such as wheels, control arms, springs, etc.) in order to install the sways, and as a result, more things that can possibly causing this noise issue. I highly recommend this product because it is great! But I wish the installation was not quite as difficult as it was for me. In addition, the provided installation manual did not provide information on how to properly adjust the collars and to what torque specifications the end links should be. This might also be the cause for the noise issue that I am having. Possibly from an end link binding issue. Excellent mod for improving handling and balance in the car without upsetting daily driving comfort. I just finished an autocross today and this swaybar allowed the car to rotate nicely when I wanted it to. This swaybar transformed my 2016 6 into exactly what I wanted. An absolute must if you want crisp and flat handling! Installation wasn't terrible, however if you have access to a hoist or willing to pay the 1.5 hours labor at a shop that you can trust, I'd advise this for those who don't have time, space or know-how. Is this the same bar for the 3 & 6? Great product, did this with the springs, Install was a little tight, but I have bigger hands lol. If you enjoy driving at all, I'd recommend just going straight to the stiffer setting. If you have 18" wheels, you'll need it. My 2L/6Spd Touring hatch just killed a built R32 GTR in the local autocross; and I gotta say, I'm more than stoked!,Thanks Corksport!! Works for mazda 3 2.2 Diesel skyactiv 2014? Just an update as I've driven on the stiffest setting for the past week or so.. it's even more amazing now! Hardly any body roll at all and understeer is at a minimum, slightly stiffer springs (hurry up already! lol) will probably get rid of the rest. It takes corners like a dream, turns that use to squeel tires are solid and all grip now. Definitely didn't need bigger/stiffer bar though, not for street use, this one is perfect! I can't wait to go tear up the Tail of the Dragon next week, I just wish I could have had springs by then.. but stock + this bar will do just fine, it's a great improvement and 100% worth the money. Just installed it on my Sedan a couple days ago. I immediately threw my car around every corner and the difference is very noticeable. I don't even have it on the stiffest setting and it has reduced the understeer significantly. Install was a lttle tedious and but worth it! I've had the bar installed on my sedan for about a month now and am enjoying it greatly. The install was a bit involved but the clear and detailed instructions were very helpful. It took a bit over an hour from start to finish but was well worth the time and money spent. I've only used the bar on the softer setting so far and can still feel a difference when cornering hard. The rear of the car stays planted and reduces overall body roll. I think the rear bar will compliment a lower and stiffer suspension greatly, I recommend it to anyone looking to improve cornering feel and overall handling. Well done, CorkSport! Are you sure this will work with the sedan as well? 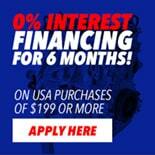 Does this work on both Sedan and Hatch?